A dangling and open design gives this necklace an elegant appeal. 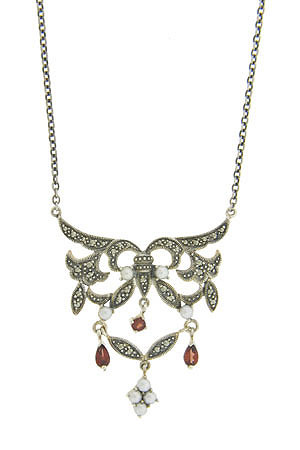 The necklace is set with marcasite and pearls while two garnets dangle and add color. The pendant portion measures 1 1/2" long, 1 1/2" wide. The chain is 14" in length, with the ability to be lengthened to 16".